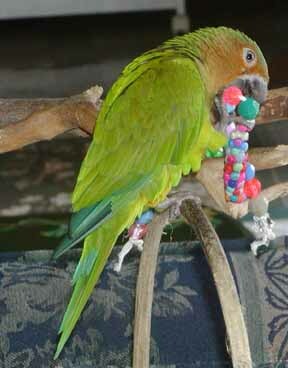 Choon Choon, the Brown Throat Conure shown above enjoying the Not To Worry Beads (NTWB) foot toy, lives in Japan with "parronts" Steve & Junko and CAG FIDlings (feathered siblings) Opaa & Wolfy (pictured far right - Wolfy in front enjoying a medium NTWB and Opaa in the background watching the photo taking session - what a great playground for the FIDs). Choon Choon has been a chronic egg layer for about 8 years - never playing with a toy for all of her 9 years. She has fallen in love with these NTWBs and is shown "enjoying" different areas on a NTWB foot toy. Congratulations to Steve & Junko for never giving up and continuing to try to get Choon Choon working on something other than egg production! 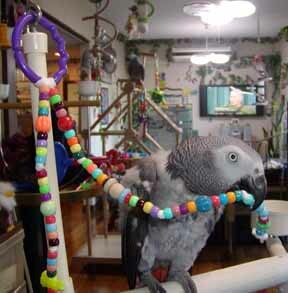 Not to Worry Beads were developed by Sharon Bloch, co-founder of TARA (Tucson Area Rescue and Adoption), for her CAG and we found that other birds really love them too (our FIDs, especially our cockatoos, just love to pop beads). They are made to be played with and to be broken. 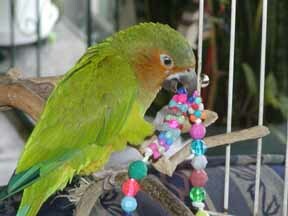 The parrots love the feel and texture of the plastic beads with all the variety and shapes plus lots of color too! Most birds like to break things and this is a safe way for them to do it. This is a great way to redirect the energies of those feather pluckers, feather twiddlers, and just plain feather worriers!